The 17 inch XPS 17 already proved to be an elegant and, at the same time, strong multimedia notebook in our last review. It was even suitable for gamers due to the potent graphics card. While the previous model was equipped with a first generation Core i processor, the new version can serve with a cutting edge Sandy-Bridge-CPU. 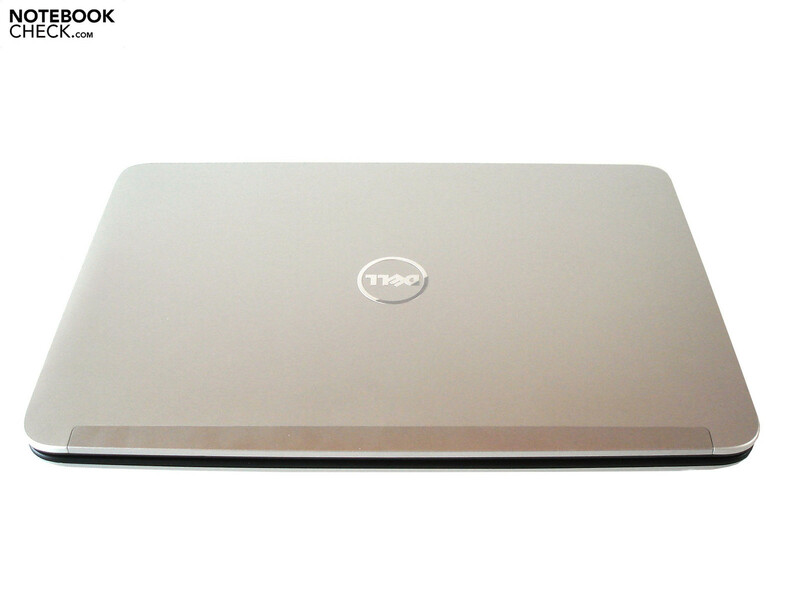 Dell almost exploits the entire product range, starting with the dual core, Core i3-2310M (2.1 GHz, 3 MB L3 cache), up to the quad core, Core i7-2820QM (2.3 – 3.4 GHz, 8 MB L3 cache) – everything you could wish for is available. The customer is also free to choose the main memory, to the largest extent. The spectrum ranges from three and twelve GB of DDR3 RAM (four GB are currently sufficient). A contemporary 7200 rpm HDD does its job as the hard disk. A swift SSD isn't available at the moment. It goes on with the display: instead of the standardly installed HD+ WLED screen (1600x900), you can choose a 3D capable FHD WLED screen (1920x1080) with a frame rate of 120 Hz if you like (60 Hz are standard). Incidentally, the mandatory shutter glasses for 3D vision aren't automatically included. Dell demands the full purchase price for Nvidia's 3D Vision kit – unashamed. To experience games, movies and pictures three dimensionally, you also have to add the according graphics card to the virtual shopping cart. The GeForce GT 550M and GeForce GT 555M – both models from the upper midrange – in their 3D version is conclusively reflected with an additional charge on the bill. But the configuration options aren't by long exhausted with that yet. For example, the DVD burner can be replaced by a BluRay combo drive (burns CDs and DVDs), which would be handy for movie fans. 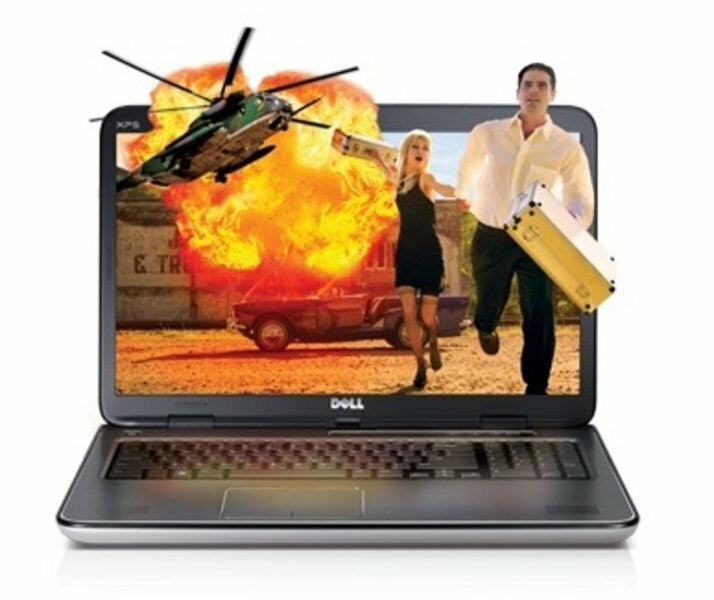 Talking about movies and TV: Dell optionally offers a DVB-T tuner, as well. 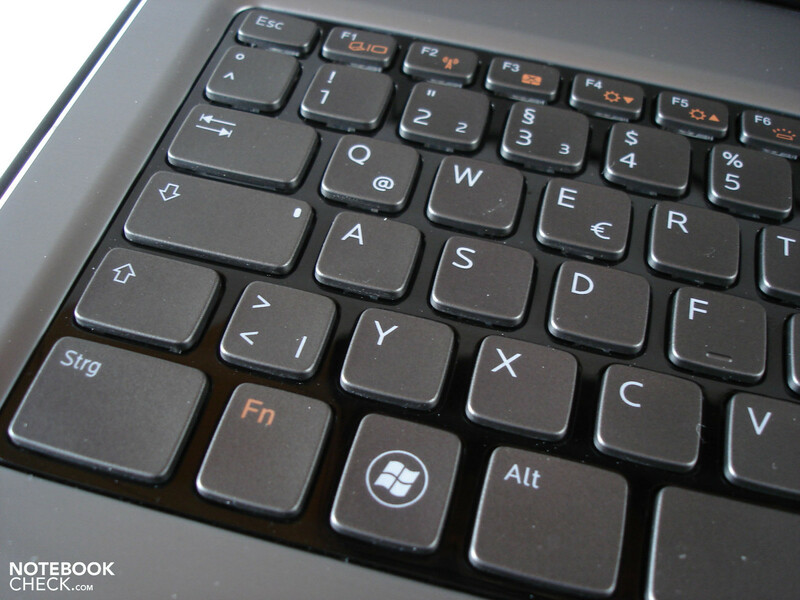 Users who frequently work in the dark should opt for an illuminated keyboard. The decision about the operating system should be easier. Windows 7 Ultimate won't provide most users with any noteworthy advantages. Windows 7 Home Premium usually suffices. Finally, either a battery with six cells (56 Wh) or a nine cell battery (90 Wh) can be chosen, depending on the model. 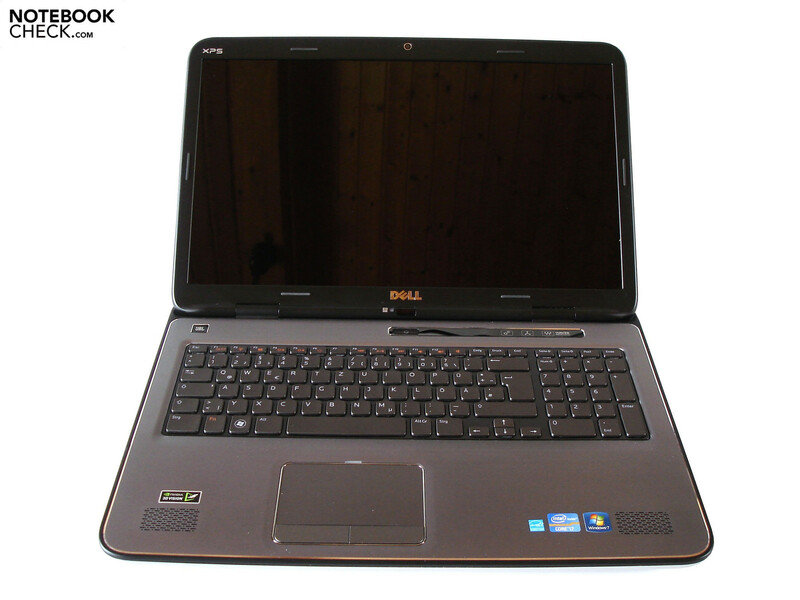 The most expensive XPS 17 alternative, L702X, served as our test basis. It started at a fair price of 899 euros at the time of this review. The model we had, equipped with a Core i7-2630QM, GeForce GT 555M (3D), four GB of RAM, a 500 GB HDD, a Full HD display, BluRay drive, TV card, illuminated keyboard and Windows 7 Home Premium 64 bit (see the right for more configuration details), added up to 1334 euros. The new XPS 17's case is almost absolutely equal to its predecessor. The resistant, matt silver surfaces, which are partly made of aluminum, are well manufactured and make a high quality impression. Beyond that, black borders set nice accents; the rounded design won't appeal to everyone though. In regards to stability, the notebook hardly has to accept criticism. Especially the case has an extremely high torsional stiffness. The lid isn't quite as good in return. It allows itself to be bent and pressed noticeably. Then again, the tightly pulled hinges couldn't really convince us. 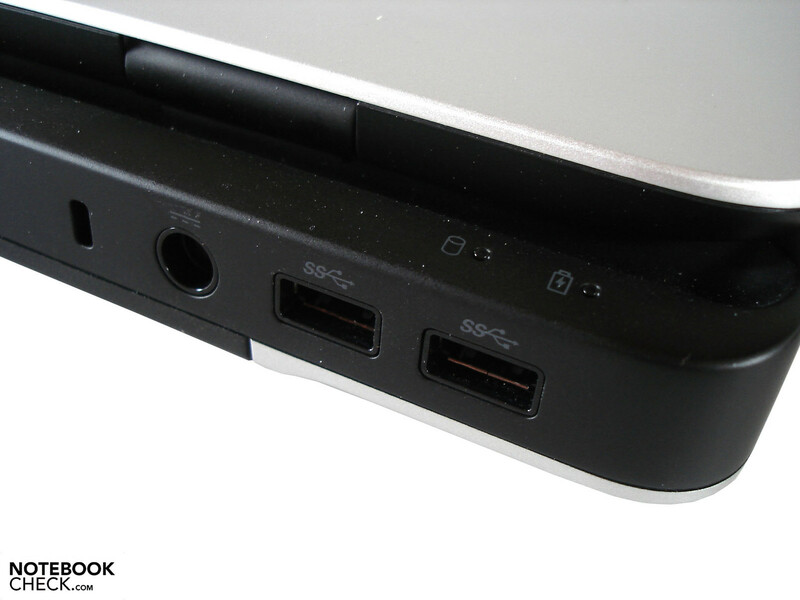 For one thing, the base unit partly lifts extremely when the laptop is being opened. For another, surface vibrations occasionally force the display to wobble. In view of the weight of 3.6 kilograms (w. 9 cell battery) and dimensions of 415x287x59 millimeters, the laptop has been rather more designed for stationary use. 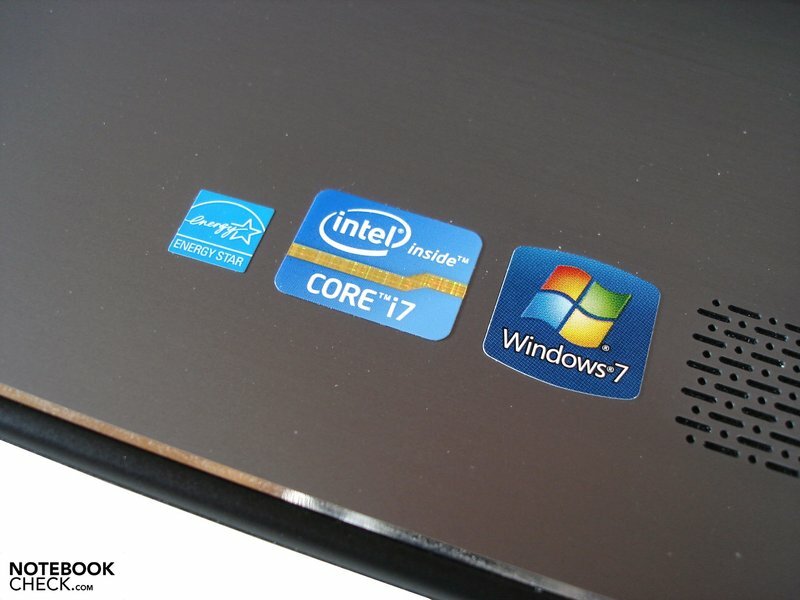 We have classified the XPS 17 as a desktop replacement, in combination with the good performance. Nothing's been changed in terms of connectivity. We are still looking for a FireWire port and an ExpressCard slot, but the XPS 17 shows itself generously equipped otherwise. 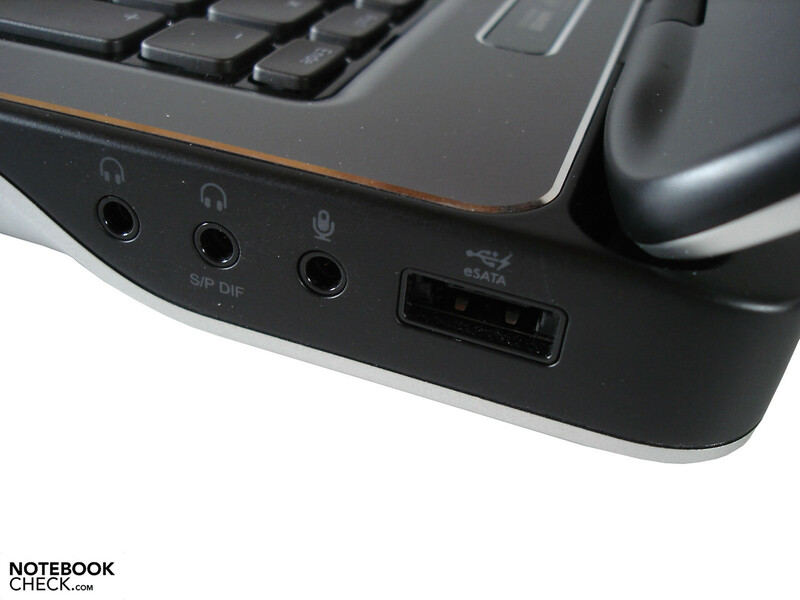 The intelligent port placement deserves special praise as it takes an example on desktop replacements. Since the majority of interfaces are on the rear, there is a pleasant amount of room beside the laptop. An RJ45 gigabit LAN port, a HDMI respectively (mini) display port out and an antenna socket for the optional TV card follow two latest USB 3.0 ports, the power socket and a Kensington lock on the rear. The left is equipped with a third USB port (2.0) and a 9in1 cardreader. The right finally has two audio out, an audio in and an eSATA/USB 2.0 combo port. If you like to surf on the Internet or share data wirelessly, you can exploit the XPS 17's full potential. The wireless module from Intel (Centrino Wireless N 1030) installed in our device is capable of WLAN b/g/n and Bluetooth 3.0. The software configuration is quite generous. 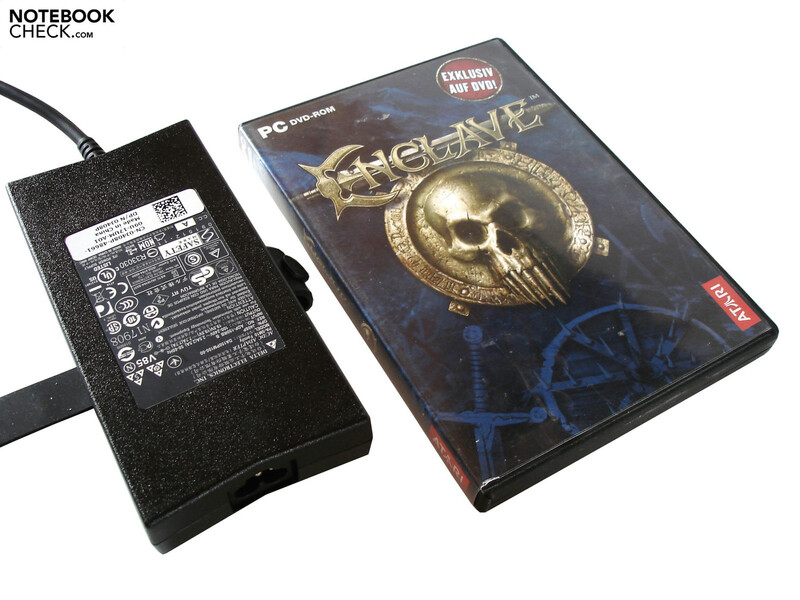 Apart from various Dell programs, the full version of CyberLink's PowerDVD 9.6 would have to be primarily mentioned. It can, according to the start desktop, also render 3D BluRays. However, in order to tickle out the system's maximum speed, and especially in the beginning, to not be harassed by pop up reports, you should part from the one or other software program. The scope of delivery proved to be apt. 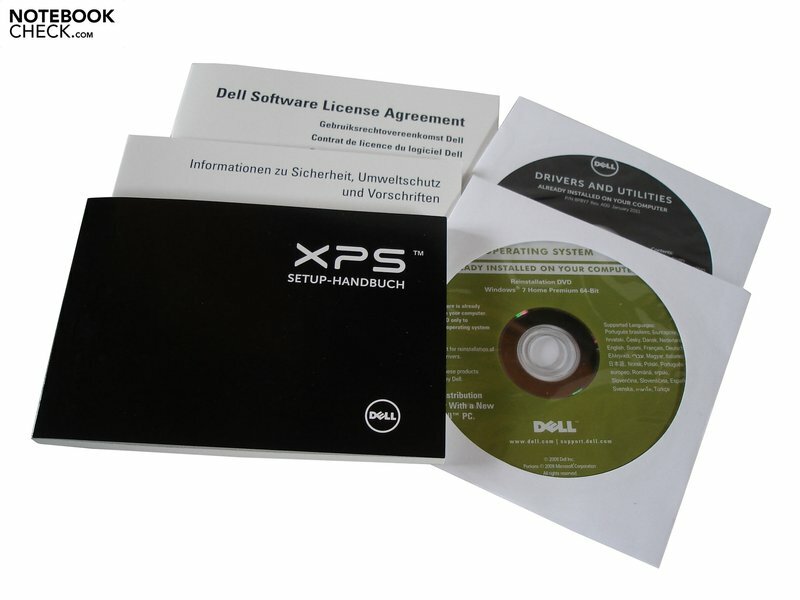 Aside the flat power adapter (130 or 150 watts) and the battery (6 or 9 cell), Dell adds a manual, a few information leaflets, a driver & tools DVD, as well as a data carrier with the operating system to the XPX 17. Barely another manufacturer offers such an amount of services as Dell. If you have enough resources you can extend the one year pick up & return service to a 12 to 48 month onsite hardware support. Dell has done a good job with the input devices. The keyboard especially stands out from the competition with its optional (white) illumination. You don't have to awkwardly search for single keys in the dark, but have everything under perfect control instead. A key size of 14 x 14 mm is fairly small, but thanks to the chiclet design (single key layout) you can cope perfectly after a certain amount of accommodation. 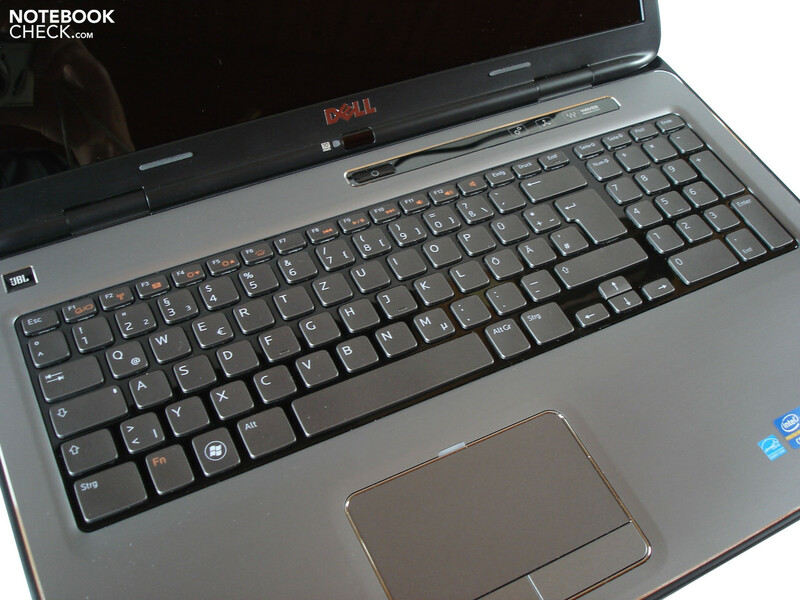 The well designed layout, not to forget the special function keys' clear symbol language contributes to that as well. We would describe the typing feel as good, whereas the stroke could be a bit crisper in our opinion. 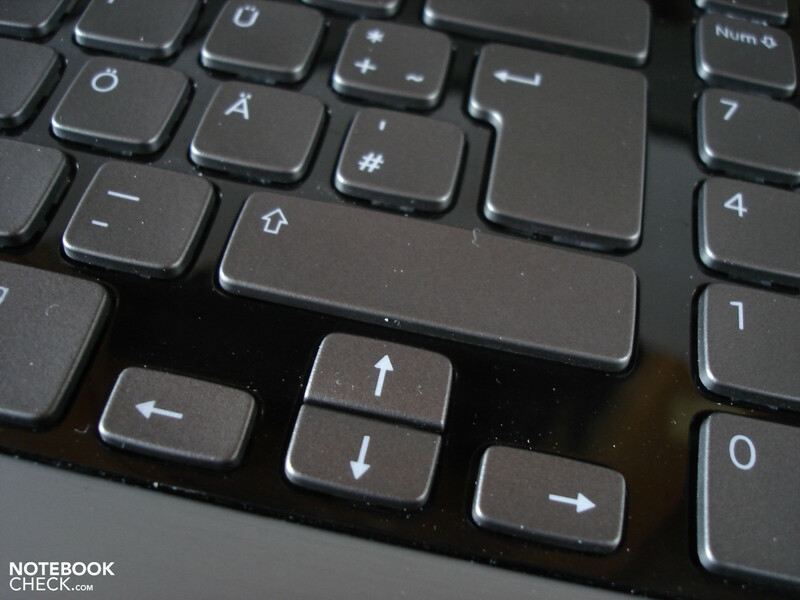 Annoying: The black key gap between the keys quickly collects dirt. 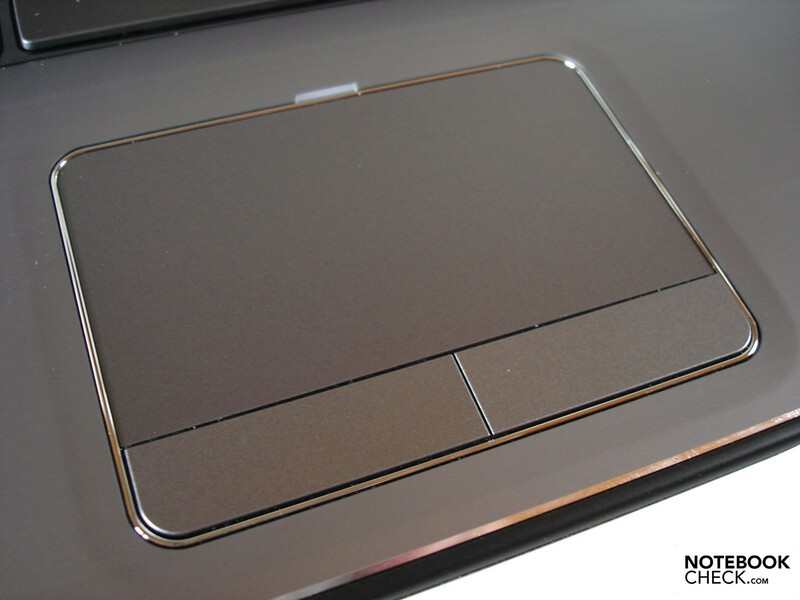 The 100 x 56 mm touchpad is one of the XPS 17's biggest pros. The smooth surface ensures very good gliding traits. Beyond that we can verify that the touchpad has a great accuracy. In addition, it supports various gestures (e.g. zoom and scroll), which is triggered by two fingers as usual. The touchpad can be disabled to avoid unintentional hitting during gaming. However, Dell should improve the mouse keys. We find their feedback a bit unclear. The XPS 17 is one of the few notebooks available on the market that can serve with a 3D capable screen. The screen renders a scene from two slightly different angles or perspectives in the stereoscopic 3D reproduction, which is most commonly used at the moment. A three dimensional experience is implied to the user when each eye is allowed to only see one of these so-called half images with help from an optical aid. Dell exploits Nvidia's 3D Vision Technology for the 3D effect implementation, which works on the basis of shutter eye-glasses. The shutter eye-glasses alternately fade in one of the glasses in rapid sequence so that the viewer gets a spatial impression. A screen with a frame rate of 120 Hz is mandatory to make this process run smoothly. The 60 Hz of a standard screen isn't enough for a flicker-free rendering. Aside the moderate wear comfort after longer use, the massive brightness loss is one of the biggest drawbacks of the shutter system. As mentioned in the beginning, the shutter glasses also cost extra. More information about Nvidia's 3D Vision can be found in our detailed review. Apart from the high frame rate, the display can score with a high resolution. 1920x1080 pixels are just right for a 17.3 inch laptop. There is a lot of desktop available. Working with two parallel opened windows proves to be unproblematic. The picture quality of the installed LGD02C screen can convince across the board. The brightness settles to an extremely high level with an average of 396 cd/m2. We have hardly ever measured such an exceptional brilliancy until now. Most vying products have to admit clear defeat. The contrast is also beyond any doubt. 806:1 are outstanding for laptop conditions. The black value doesn't mess it up either with 0.52 cd/m2. Colors look saturated and natural, the sRGB color spectrum is covered well. The display isn't necessarily targeted at professional users though. 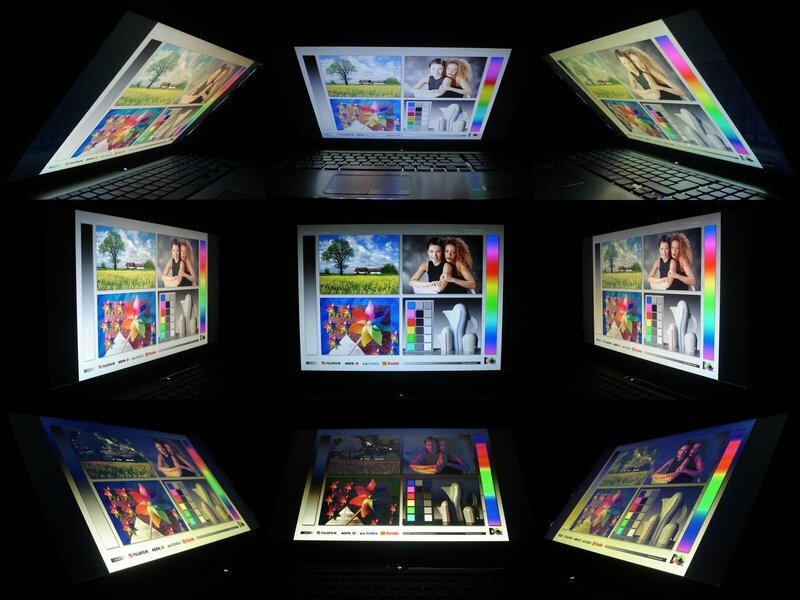 It would need at least a B+RG screen as in its smaller brother, XPS 15, for the AdobeRGB color gamut. Despite the excellent brightness, outdoor use is only possible with restrictions. 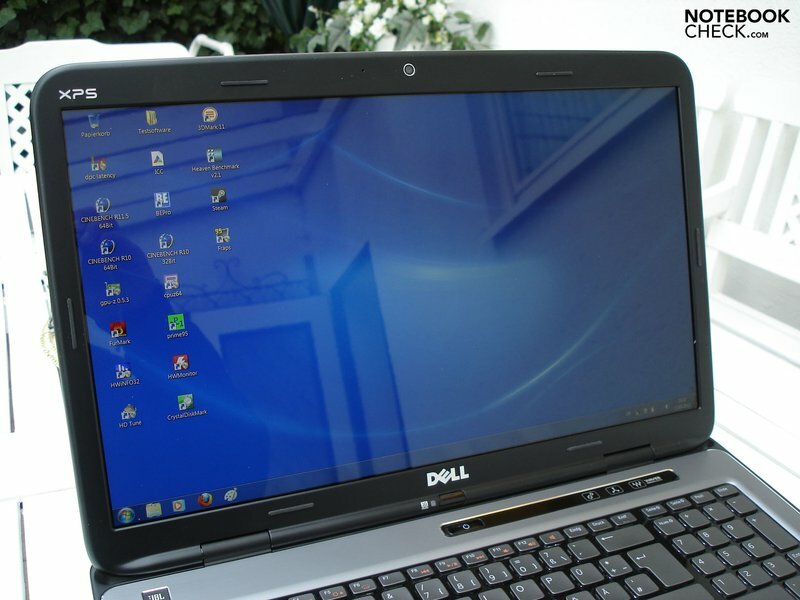 Since Dell uses a high-gloss display surface, disagreeable reflections are frequent. Reflections are occasionally even an issue indoors. You should always look for a suitable place. It's really too bad that Dell hasn't opted for a matt display surface. The picture quality would have been good enough in any case. The viewing angle stability is above average. Colors and brightness only change in greater deviations on the horizontal plane. Misrepresentations turn up sooner on the vertical plane. But you hardly ever have to readjust the display. All in all, the Full HD display is a real pleasure. The competition should take an example from it. Intel's latest processor generation, with the codename "Sandy Bridge", currently can't be excelled in performance. The customer is spoilt for choice in the configuration. 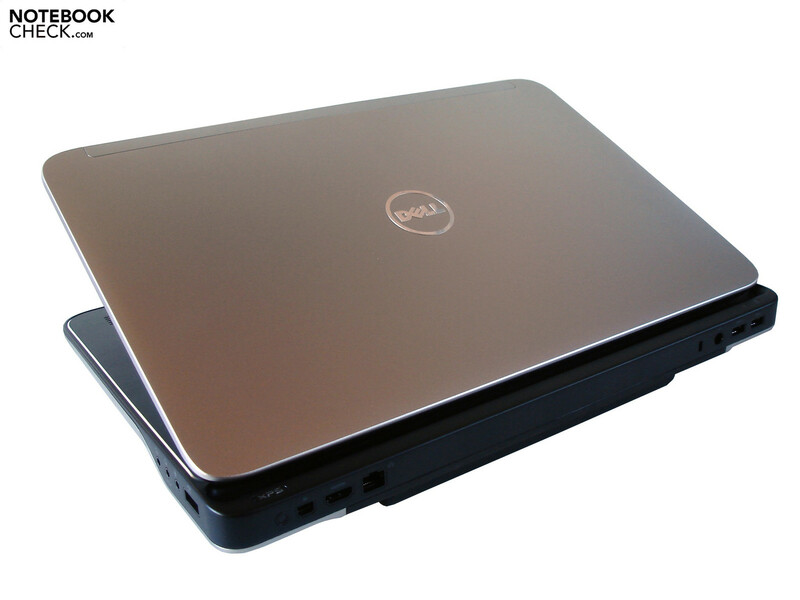 He can choose among many models from the Core i3, i5 and i7 range. 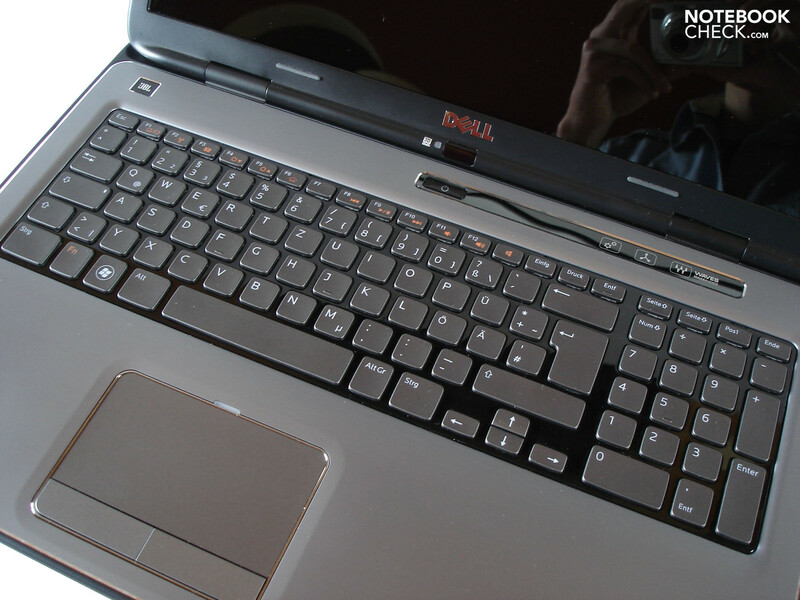 The XPS17-L702X we reviewed is standardly equipped with a quad core. The Core i7-2630QM has 995 million transistors and six MB of L3 cache. It natively clocks with adequate 2.0 GHz. However, single cores are overclocked up to 2.9 GHz provided that the load and temperature allow it – thanks to Turbo Boost Technology. On the other hand, another technology called Hyper Threading is responsible for simulating four virtual cores. Thus the Core i7-2630QM is able to process a total of eight threads, including the four physical cores, at the same time. A maximum power consumption of 45 watts isn't exactly little, but it's acceptable in view of the excellent performance. Incidentally, the installed graphics chip, HD Graphics 3000, is not useable in the alternative with the 3D display, respectively graphics card. It lacks Nvidia's Optimus Technology for automatic graphics switching. Intel's latest dual and quad core CPUs calculate at about the same speed when an application only uses one core. The Core i5-2410M (Dell XPS 15) and Core i7-2630QM, for example, are on par in Cinebench R10's 64 bit single core rendering with 4517 to 4530 points. In return, a quad core can exploit its higher core count in multi core rendering. The Core i7-2630QM can race past the Core i5-2410M by 71% with 16830 to 9839 points. The Cinebench R11.5 64 bit CPU score is even clearer in favor of the quad core: 4.84 to 2.58 points equal an advantage of 88%. Dell has made an interesting decision in terms of the graphics card. Nvidia's GeForce GT 555M cleverly fills the gap between midrange (e.g. Radeon HD 6650M) and upper range (e.g. GeForce GTX 470M) – a sector where barely any graphic cards are currently found. In comparison to the old GeForce GT 445M, you could actually expect a certain amount of performance increase. However, since the specifications are basically the same, the performance gain is rather low. 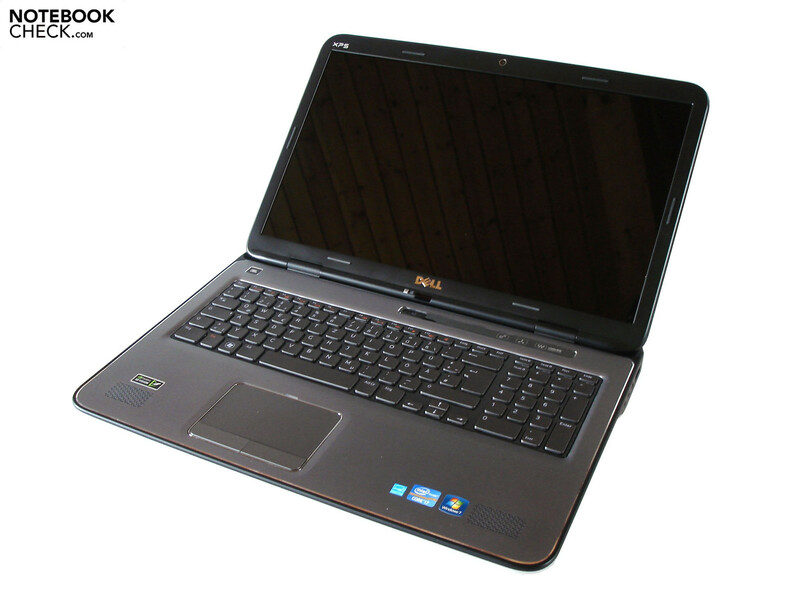 Alike the GT 445M, the GT 555M is based on Nvidia's GF 106 chip (Fermi architecture) and can make use of 144 shader units. The core runs with 590 MHz, the shader rate is 1180 MHz. Merely the memory rate has increased slightly. Instead of 800 MHz, the 3072 MB DDR3 VRAM now runs with 900 MHz. The memory bus of 192 bits is in no way extraordinary, but it doesn’t limit as much as the case of midrange GPUs. An interface with a width of 256 bit or a GDDR5 VRAM right away would have been perfect. Aside from that, the GeForce GT 555M doesn't show any fault. Especially the comprehensive feature list deserves attention. Starting with DirectX, over PureVideo HD (decodes HD videos), up to PhysX (GPU based physics accelerator): Nvidia stuffs its graphics card absolutely full of technologies. The GeForce GT 555M's graphics performance should satisfy most users. It can't quite reach the rival model from AMD, the Radeon HD 6850M (5232 points, Acer Aspire 7750G) with 4999 points, but in return, the very popular GeForce GT 540M is surpassed by 41% (3551 points, Schenker XMG A501). Now we'll take a look at the 3DMark 11 (1280x720) GPU score, where the GeForce GT 555M clearly places itself in front of the GT 540M (897 points) with 1146 points. At the same time is positions itself behind the Radeon HD 6850M (1480 points). Unigine Heaven 2.1 Benchmark (1280x1024, high, normal tessellation) opposingly favors the Nvidia graphics card. While the GeForce GT 540M reaches 13.3 fps and the Radeon 6850M reaches 14.9 fps, the GeForce GT 555M achieves 17.3 fps. The hard disk provides a perfect performance. 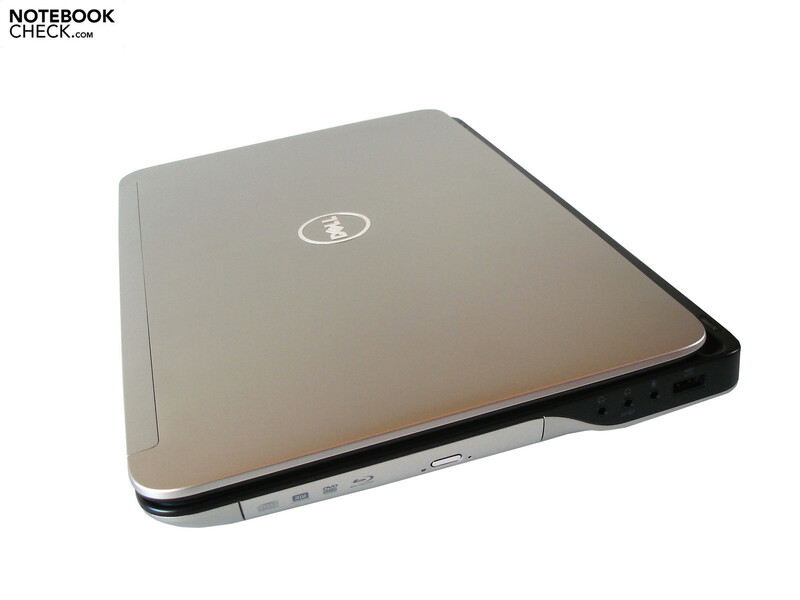 Dell has supplied our test device with a ST9500420AS from Seagate – a 500 GB HDD with a speed of 7200 rpm. The sequential read rate of 85.86 MB/s and a sequential write rate of 81.73 MB/s have to be classified as above average (CrystalDiskMark). The access rates place themselves as expected in the usual range (HDTune). The HDD looks like an old hat in comparison to cutting edge SSDs. Unfortunately Dell (still) doesn't offer an according upgrade option. 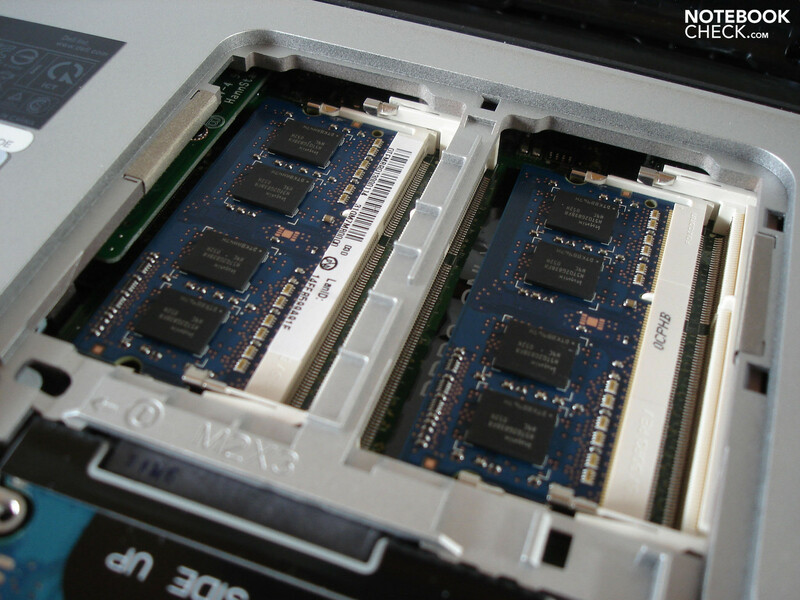 In opposition to the smaller XPS 15, two hard disks can be built into the XPS 17. 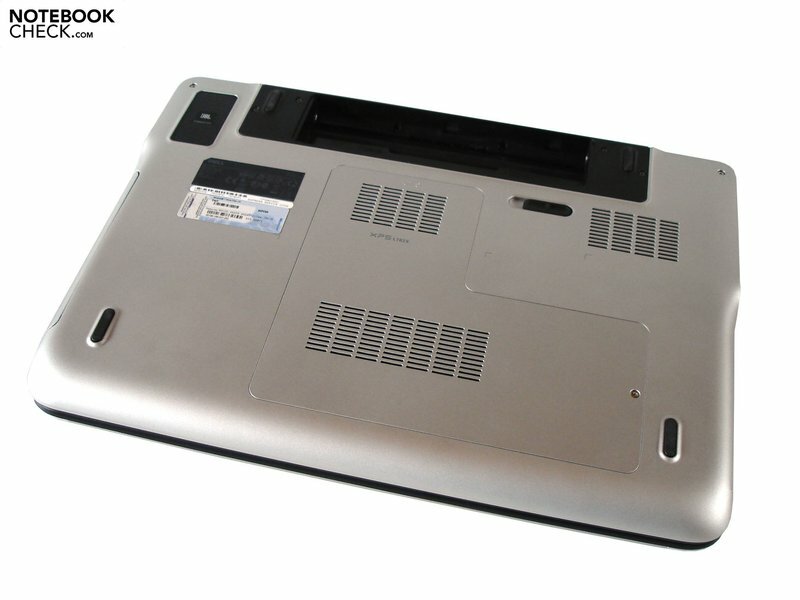 Both slots are easy to access and the necessary chassis is pre-installed. The XPS 17's application performance has absolutely no reason to hide. Intel's Sandy Bridge CPUs compute so fast that the average user should be provided for in the next years to come. 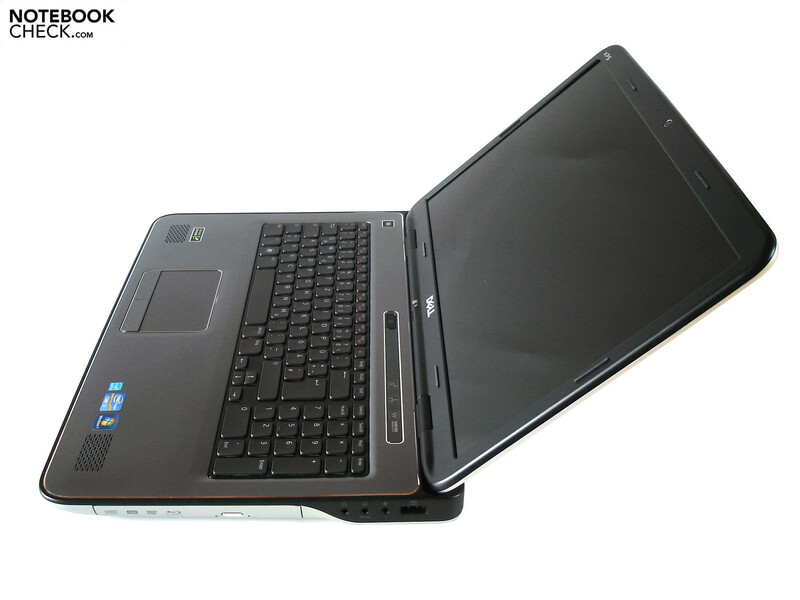 The GeForce GT 555M proves to be a strong companion, which accelerates most applications smoothly. Of course, a significantly higher performance would have been possible with a high-end graphics card, like the GeForce GTX 460M. 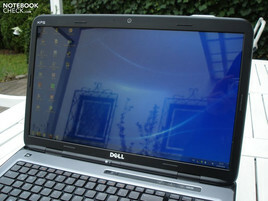 However, you can't complain in view of the price range Dell has chosen. In the run of the gaming benchmarks, two things mainly interested us. First: How well does the GeForce GT 555M perform in comparison to its most serious rival from AMD, the Radeon HD 6850M? And secondly: How big is the difference between it and the midrange? 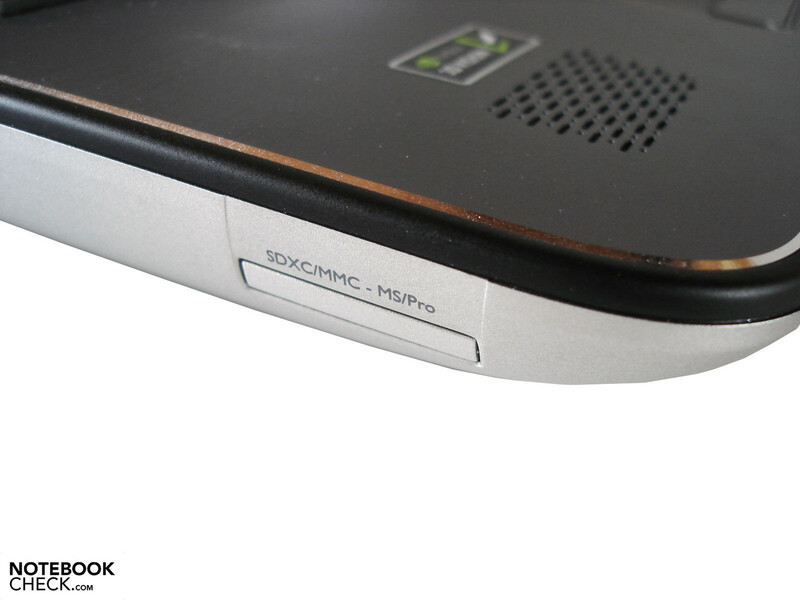 To be more precise, the GeForce GT 540M – a very successful model from Nvidia. The following three laptops were used for our comparisons: The Acer Aspire 7750G, the Acer Aspire 8950G and the Schenker XMG A501. Performance deviations can be assessed perfectly since all laptops had the same processor in the test (Core i7-2630QM). In the following, we would like to focus on the results in the native Full HD resolution (1920x1080). The graphically successful first person shooter from the developers situated in Germany, Crytek, demands everything even from high-end graphic cards. The GeForce GT 555M doesn't even come close to coping with the pre-setting "extreme" in a resolution of 1920x1080. An average of 13.3 fps is far too little for a track out of the first person view. On the other hand, Crysis is acceptably playable on the XPS 17 in the pre-setting “very high” and a resolution of 1366x768. We determined 41.6 fps at the beginning of the single player campaign. Since the technical structure of Black Ops is several years old in the meantime, new graphic cards don't have a problem with the latest Call of Duty sprout. Even when very high details, quadruple antialiasing (AA) and octuple anisotropic filtering (AF) are used, the frame rate remains within a playable range. The XPS 17 achieved good 42.9 fps. Thus, the GeForce GT 55M surpasses the GeForce GT 540M by a whole 53%. The latter has to be satisfied with low 28.0 fps. Despite its not exactly referential looks, the performance of the real time strategy hit likes to cave-in in computing-heavy scenes. The XPS 17 adequately finished our benchmark sequence, the intro of the "For the Swarm" challenge, in the ultra setting. The GeForce GT 555M not only beats the GeForce GT 540M (17.3 fps), but the Radeon HD 6850M as well, with 24.0 fps. If you want to enjoy StarCraft 2 smoothly in maximum details, you should reduce the resolution to 1600x900. The XPS 17 inexorably fails in the graphically extremely demanding first person shooter, Metro 2033. A combination of very high details, DirectX 11 mode and 1920x1080 retards to a complete jitter party with 7.5 fps. The GeForce GT 540M also has to give up with a meager 5.2 fps. You shouldn't demand more than 1366x768 pixels, medium details and DirectX 10 mode from the GeForce GT 555M. 39.2 fps are suitable for playing. The multiplayer whopper from the developers, DICE, is easier for the XPS 17 to swallow. 1366x768 pixels, high details and quadruple anisotropic filtering run fairly smooth with 41.3 fps. In return, the GeForce GT 555M can't deal with 1920x1080 pixels, high details, quadruple edge smoothing and octuple texture filtering. The same applies to the Radeon HD 6850M (18.9 fps) and the GeForce GT 540M (15.5 fps), which are a bit slower in performance. Although role games are perceived as quite smooth in the third person perspective starting at 25 fps, the XPS 17 isn't strong enough for high details and quadruple anisotropic filtering in the native resolution. The GeForce GT 540M (17.2 fps) clearly has the lead on the GeForce GT 540M (17.2 fps), but the winner in Risen exceptionally is the Radeon HD 6850M (23.3 fps). If you want to explore the freely accessible island world in high details, you should use the resolution 1600x900. We would like to finish the gaming benchmarks with a game from the race category. Need for Speed: Shift isn't able to show the XPS 17 its limits. In view of 33.2 fps, which we measured on the London Circuit, even high details, quadruple antialiasing and 1920x1080 pixels are possible. The GeForce GT 540M is too weak for these settings with 23.9 fps. The GeForce GT 555M keeps the upper hand by 39%. We can give the GeForce GT 555M a positive rating after our extensive tests. Most games are rendered smoothly even in high details and activated quality enhancements (AA & AF) at moderate resolutions. 1600x900 pixels are often the limit, 1920x1080 are too much for the GeForce GT 555M. Great: Low resolutions are perfectly interpolated by the XPS 17's screen. The GeForce GT 555M doesn't need to fear the AMD competition, the Radeon HD 6850M lags behind by a tight 10%. The GeForce GT 540M doesn't stand a chance in a direct comparison. You are almost 50% faster with its stronger brother. Overall, the GeForce GT 555M is mainly designed for gaming ambitious users who want as much performance as possible in the 1000 euro price range. Demanding gamers who first are satisfied with high-end graphic cards starting at the GeForce GTX 460M have to dig a bit deeper in their pocket. Note: Since the frame rate just about halves itself in 3D mode, high resolutions and detail levels are basically taboo in the third dimension. The high emission rates are the XPS 17's greatest shortcomings, just like in the previous model. The case fan whirrs very audibly, and likely already annoying for some users, during high load. To fully indulge into a game you either need a high speaker level or even better a headset. 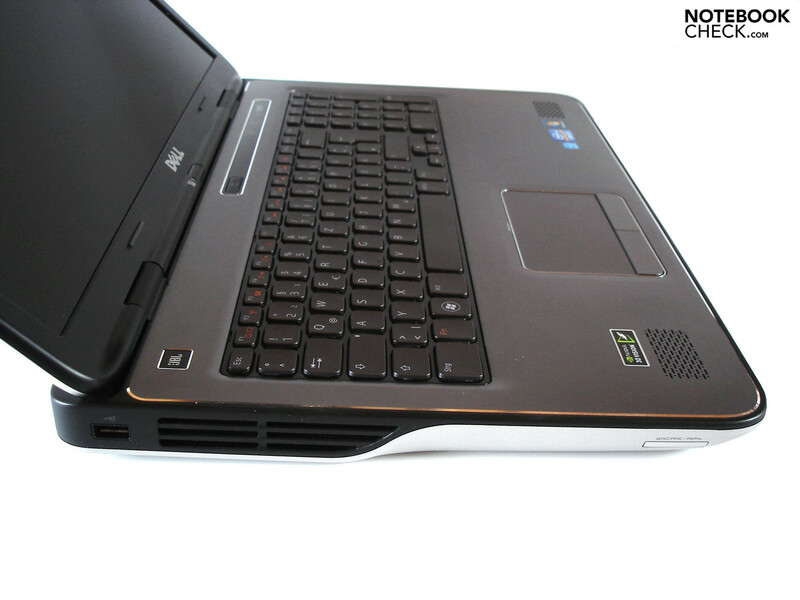 The 17 incher works a lot quieter in less resource demanding tasks, such as office or Internet. However, the fan's behavior gives reason for complaint. Except for a slight purr from the hard disk, the notebook is fairly quiet in idle mode. But the fan turns up to a noticeable level every few minutes for a certain period – annoying. Noise sensitive users who want to use a laptop primarily for gaming should principally give the XPS 17 a wide berth. 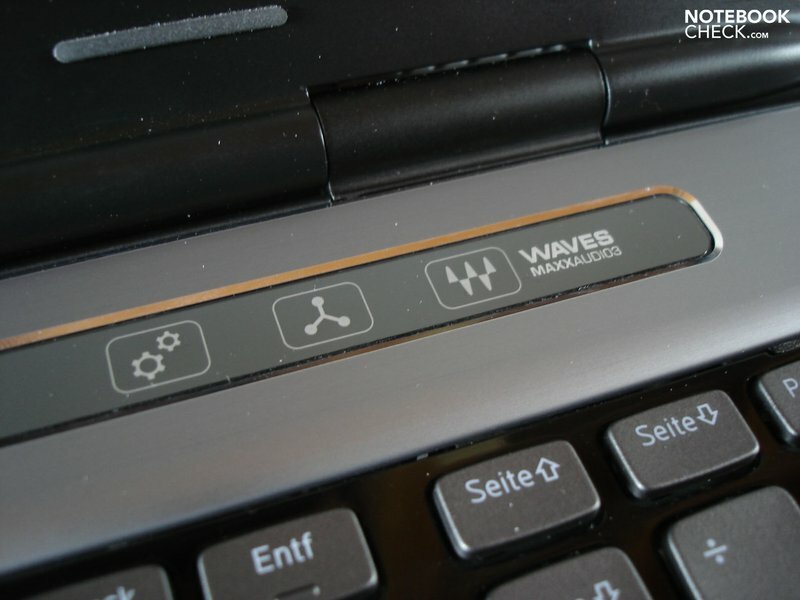 Equally fast devices, such as the Acer Aspire 7750G (is unfortunately struggling with graphic problems at the moment), are usually less conspicuous in terms of noise. 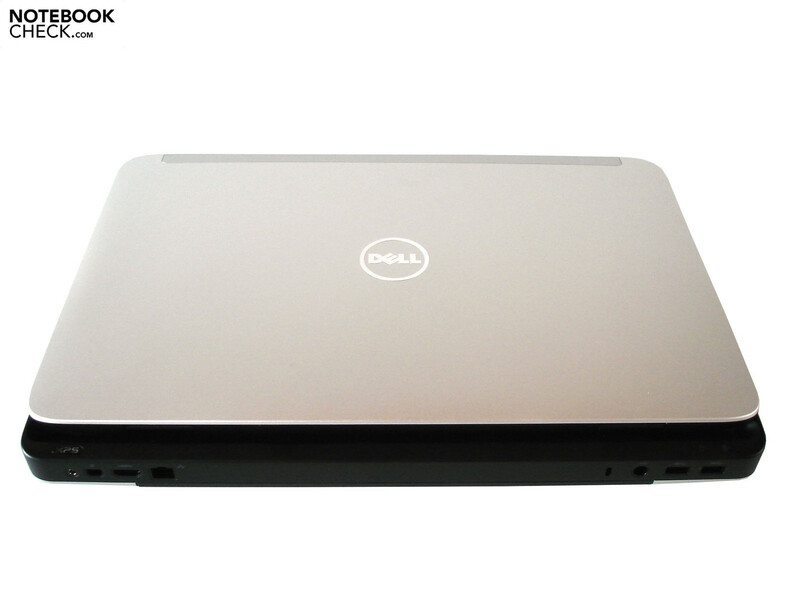 Now you might think that the obtrusive fan in the XPS 17 would prevent an exaggerated temperature development. But far from it: The case isn't exactly cool even in idle mode. Our thermometer recorded an average of almost 30°C. The surfaces heat up majorly during high load. A maximum of 48°C on the top and up to 44°C on the bottom can get very unpleasant after a while. This is especially noticed adversely on the wrist-rest during use. Our hands were evidently warmed. The situation is in no way better under the hood. The graphics card and processor settled to a high 85, respectively 90°C during our several hour stress test induced with Furmark and Prime95. The temperatures are even above average in idle mode. Not every device reaches 50°C (CPU, GPU & HDD). Nevertheless, we couldn't determine a throttling, so downclocking, of single components. (-) The palmrests and touchpad can get very hot to the touch with a maximum of 43.7 °C / 110.7 F.
(-) The average temperature of the palmrest area of similar devices was 28.7 °C / 83.7 F (-15 °C / -27 F). The outstanding sound system can pacify us again. The XPS 17 has two 5 watt loudspeakers and a 12 watt subwoofer, which originate from a cooperation with the company, JBL. The given sound easily excels the competition. Such a balanced, voluminous and authentic sound is hardly ever heard in laptops. Thanks to the subwoofer, the basses are clearly audible – it takes care of highly powerful sound during games, movies, and music tracks. The sound system can be extensively configured with help from special software. In particular, the various MaxxAudio options have a high impact on the sound. We couldn't really get comfortable with the speakers' positioning. They are located beneath the keyboard and are often covered by the palms. If you have high requirements on a laptop, the XPS 17 won't disappoint you. Since the XPS 17's 3D capable alternative doesn't have a graphics switching, the battery runtimes are rather moderate despite the strong 9 cell battery (90Wh). The laptop is drained after only about an hour when the laptop is faced with high load (BatteryEater's Classic test) with maximum brightness and disabled energy saving options. At least the battery life is fairly reasonable in fairly undemanding tasks. 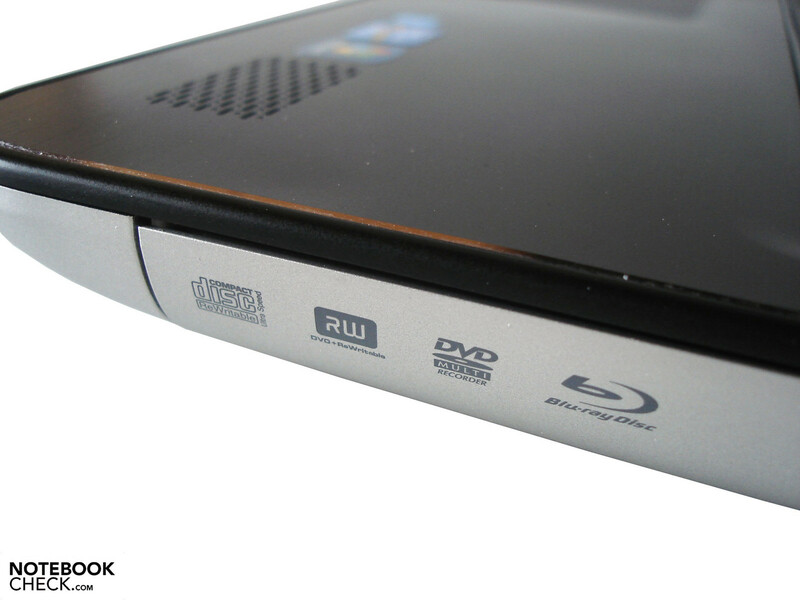 DVD rendering with moderate energy saving options stopped after two hours and 22 minutes – an acceptable result. Internet surfing via WLAN is possible for a bit longer. We achieved 2 hours and 36 minutes with Internet Explorer. 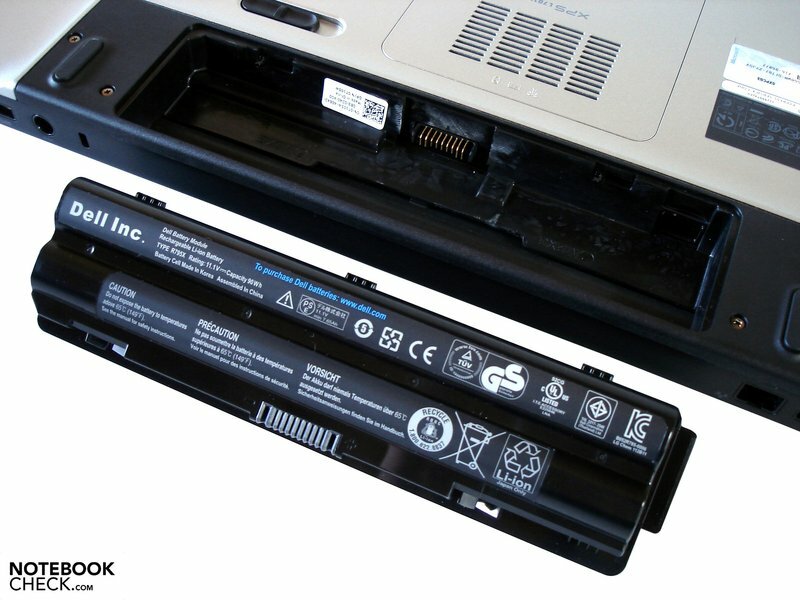 To persuade the XPS 17 to a good battery life, you would have to reduce the brightness to its lowest setting and select the highest energy saving options. BatteryEater's Reader's test ran for almost five hours. In comparison to other high performance multimedia laptops, such as the Acer Aspire 7750G, the XPS 17's power consumption is surprisingly high. 25.6 – 39.1 watts in idle mode and 102.3 – 121.8 watt during load sooner correlate to the power requirement of a full-fledged gaming laptop (e.g. 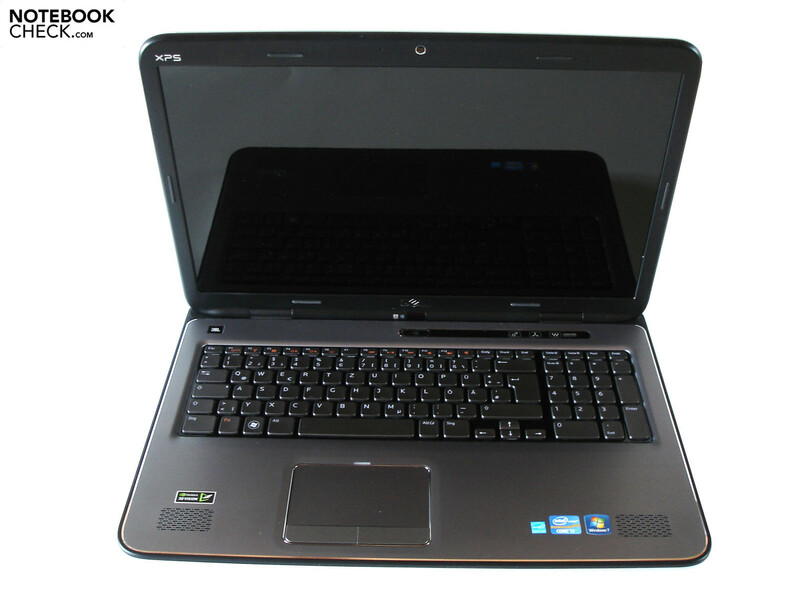 see Asus G73SW). The summary that we made in the last review for the XPS 17 can basically be repeated for the refresh. Among other things, the perfectly manufactured and high quality case would be mentioned on the pro side. It can score with resistant surfaces, good input devices and a clever port distribution. The installed 2.1 sound system from JBL will likely make some users cry tears of joy – external loudspeakers are definitely not needed. The praise continues with the 3D capable Full HD display. Its luminosity outshines the competition. The application performance is just as above average thanks to Intel's Sandy Bridge processor. Nvidia's GeForce GT 555M easily copes with most games. 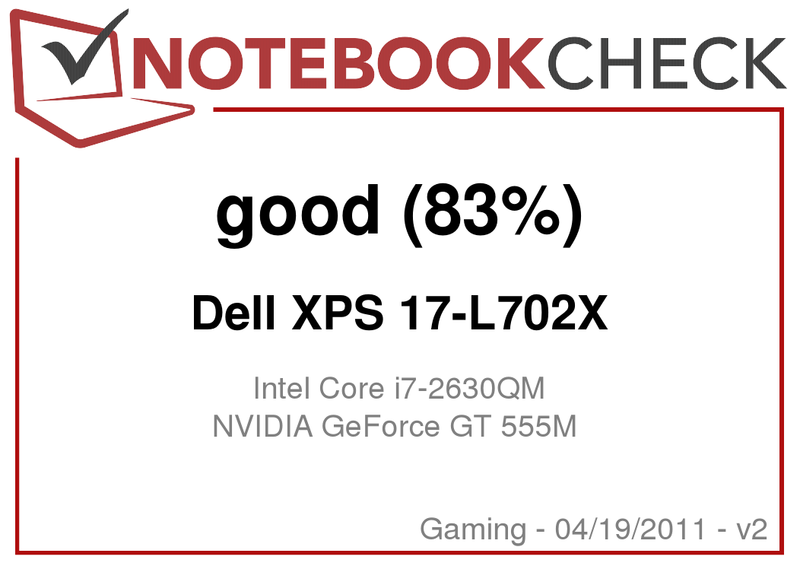 But of course, the XPS 17 isn't completely flawless. 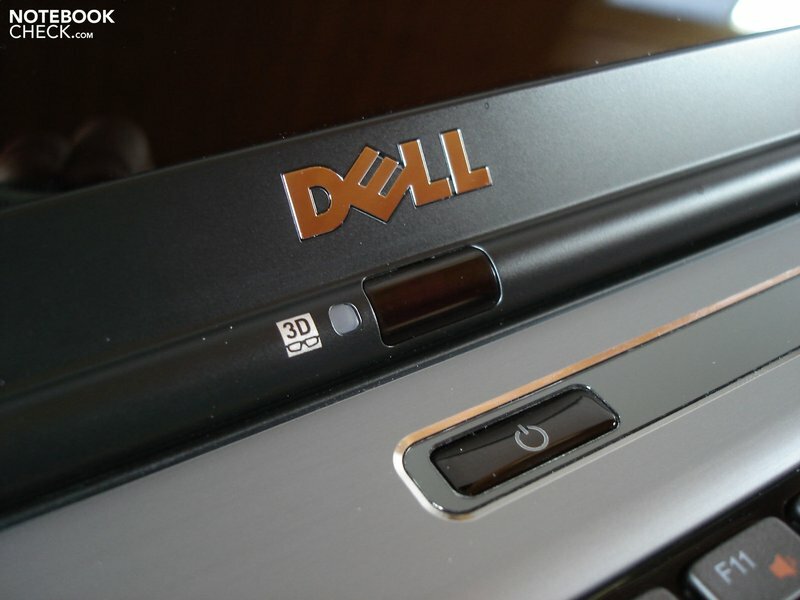 Dell should make improvements in both speaker positioning and connectivity. The high weight and poor battery life also restrict mobile use. However, the main problem remains to be the high temperature and noise development. The laptop gets extremely warm and loud during load. Generally we can say: If you want to call a 3D capable entertainment platform your own, you could take a liking to the XPS 17. 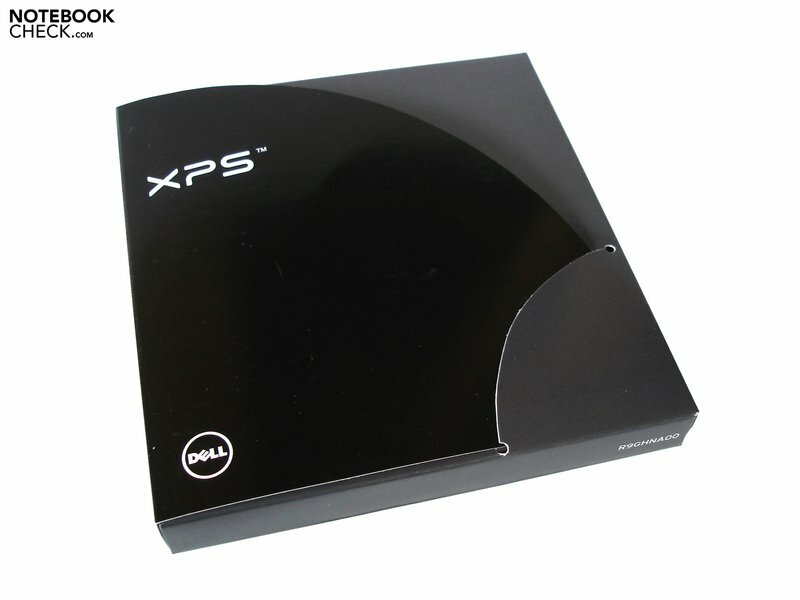 We would advise everyone else to sooner take a smaller member of the XPS family. The XPS 15 is cooler, lighter and stronger in battery life. Dell has placed a chic logo on the lid. Dirt is quickly collected between the keys. The single keys have a good size. The keyboard is also available as an illuminated alternative. 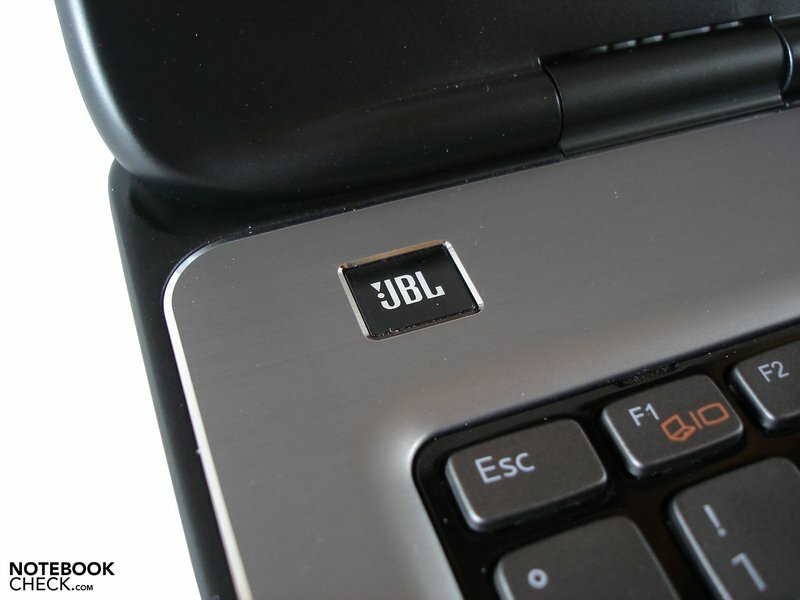 Dell has collaborated with JBL for the sound system. 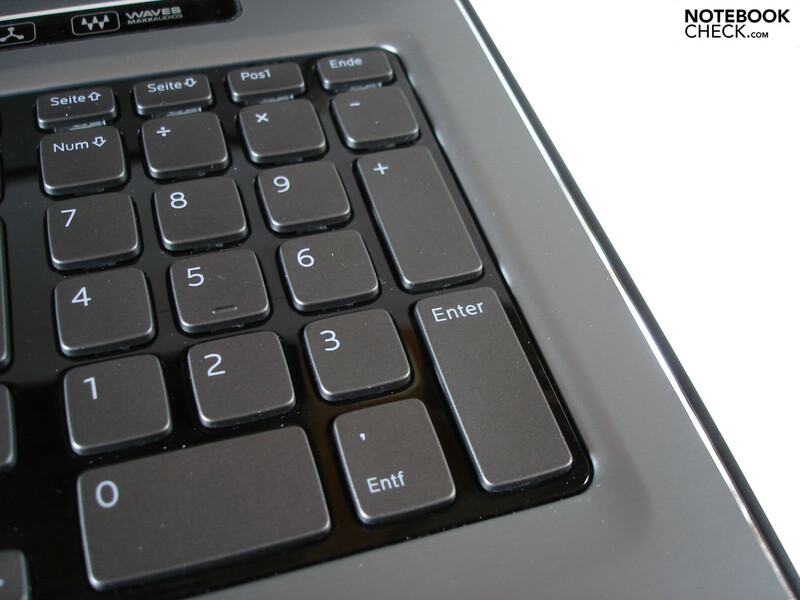 A dedicated number pad is standard in 17 inch devices. 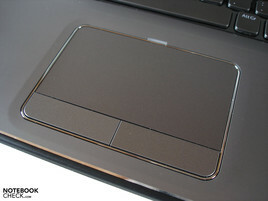 The smooth touchpad has been pleasantly sized. 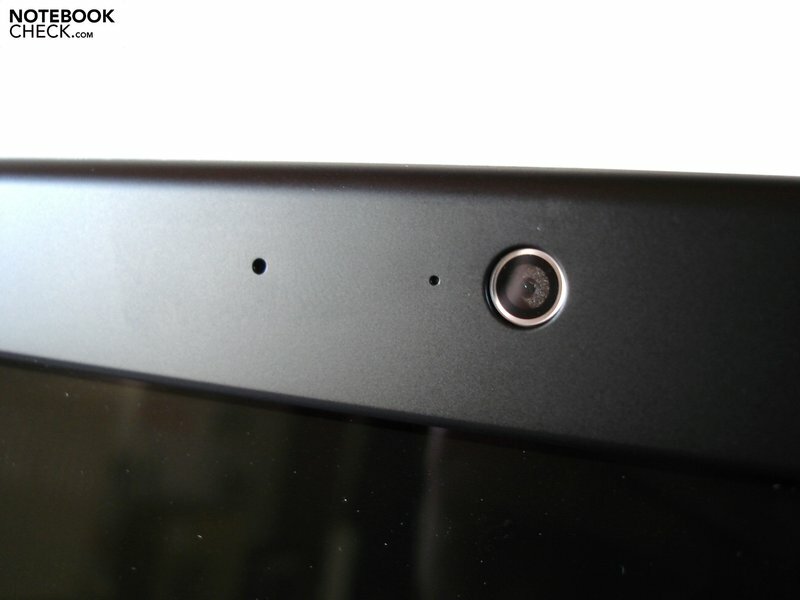 A sensor for the shutter eye-glasses is located on the display bezel. One of Intel's latest dual of quad cores serve as the processor. Both 5 watt speakers have been placed unfavorably. Data carriers and information leaflets are found in a small box. The scope of delivery is very impressive. Two fast USB 3.0 ports deserve a lot of praise. External monitors can be connected via (mini) display port and HDMI. Dell has naturally installed a cardreader. The sides remain uncluttered for the most part due to the clever port distribution. 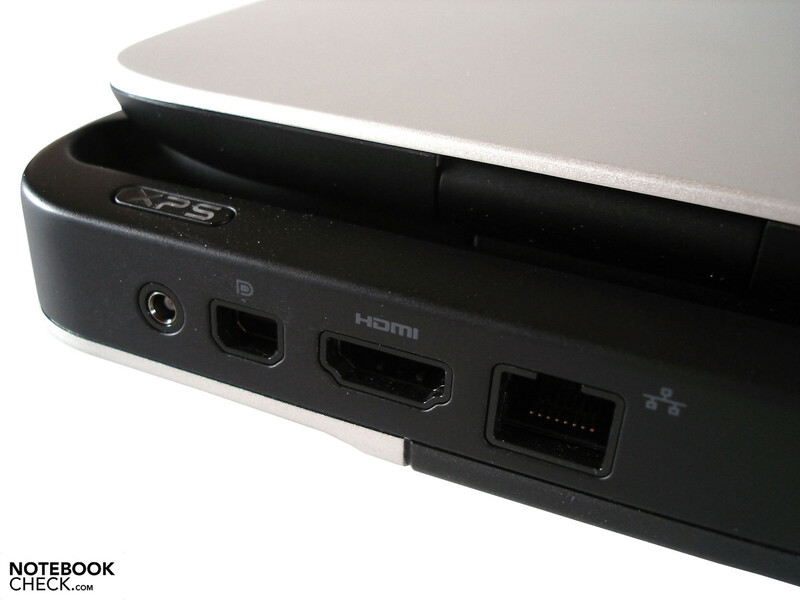 One of the four USB ports supports eSATA. A BluRay drive is optionally available. The right area starts an application for sound configuration. The surfaces get pretty warm in the vent's area. The case is almost 5 centimeters high with the 9 cell battery. 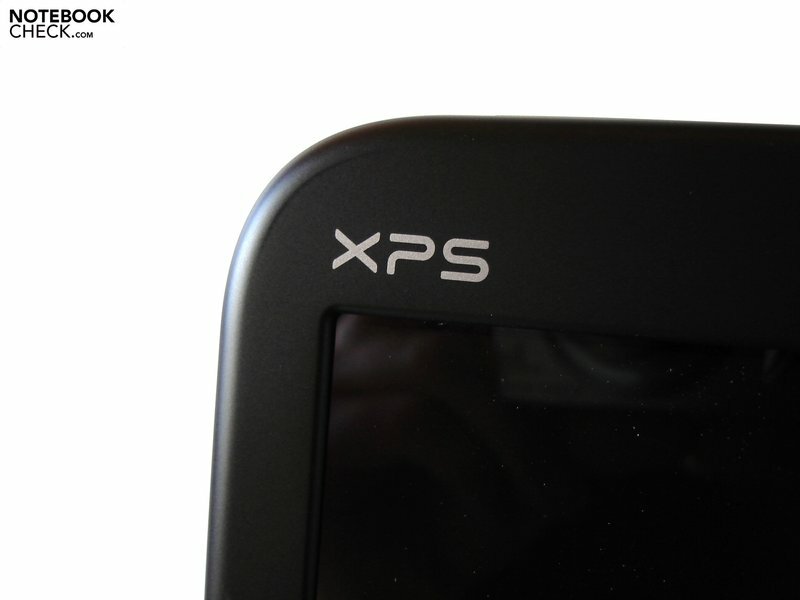 The XPS isn't exactly a lightweight with 3.6 kilograms. The high-gloss display surfaces have a tendency for unsightly reflections. We like the port distribution. The display can be averagely opened. The 17 inchers workmanship is outstanding. The unique design won't appeal to everyone. The input devices don't have to accept much criticism. 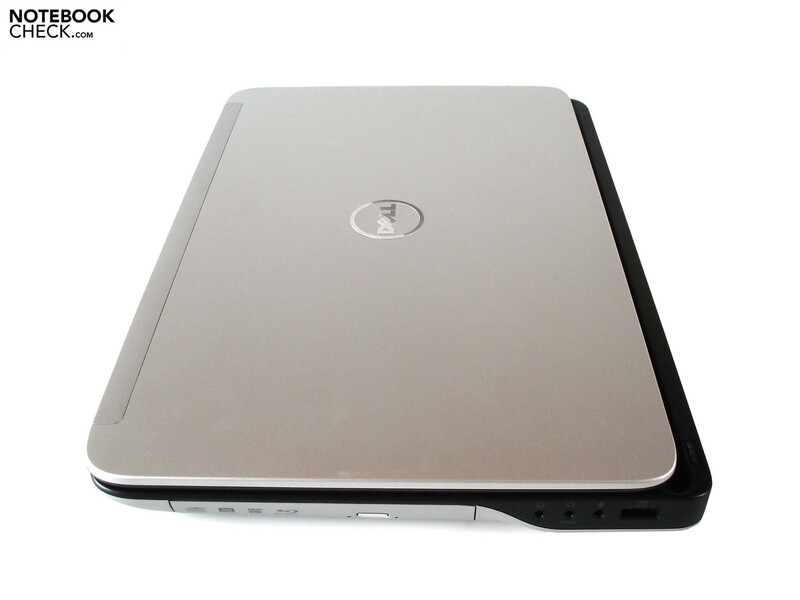 The XPS 17 has to be described as rounded in terms of design. The battery runtimes are rather moderate despite the strong battery. Our test device has a 500 GB HDD. 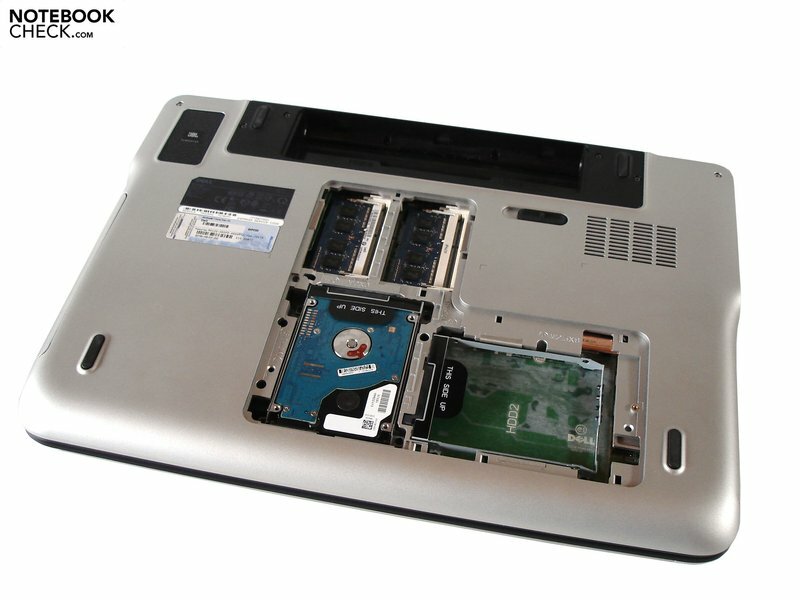 The four RAM slots accommodate a maximum of 16 GBs. 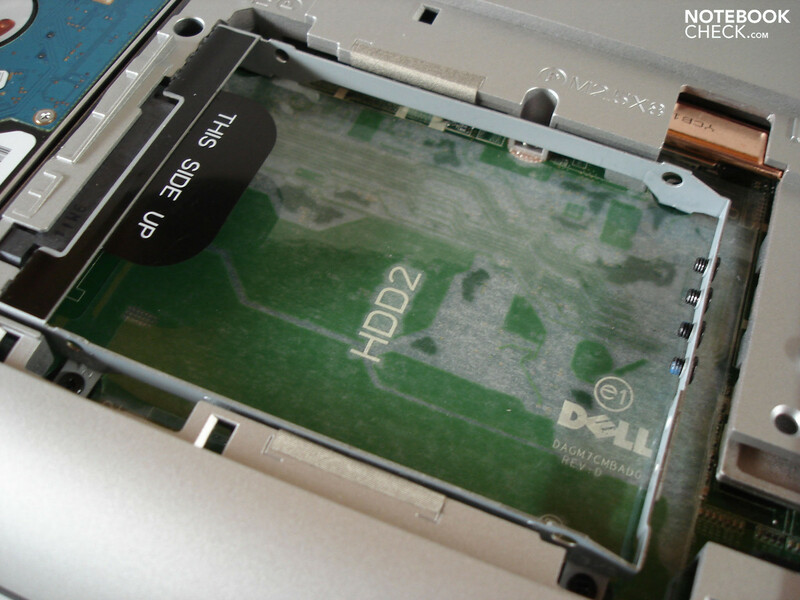 A second hard disk can be retrofitted when required. The 12 watt subwoofer supplies a powerful bass. Merely the main memory and hard disks can be accessed. The 150 watt adapter is fairly large, but slim in return. 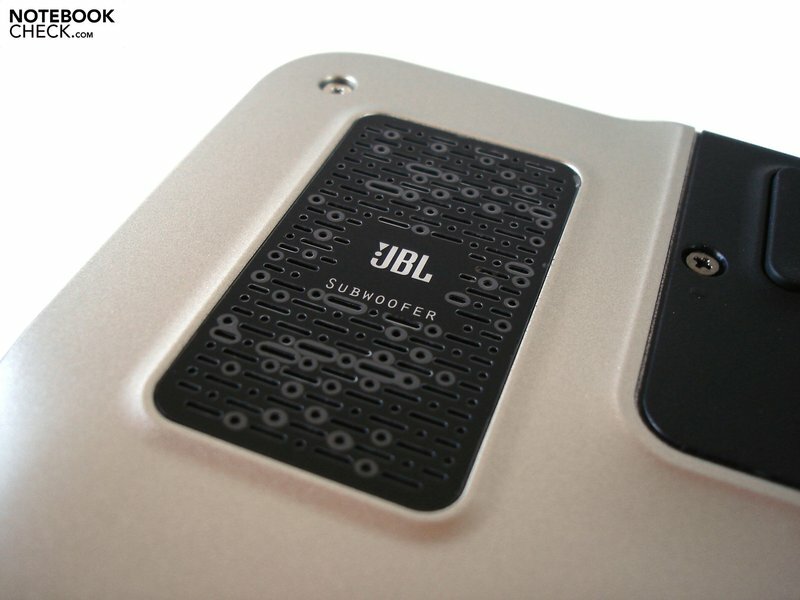 The installed 2.1 sound system from JBL supplies a great sound. Cooler case surfaces and a less obtrusive fan. The contrast rich Full HD display shines extremely bright. 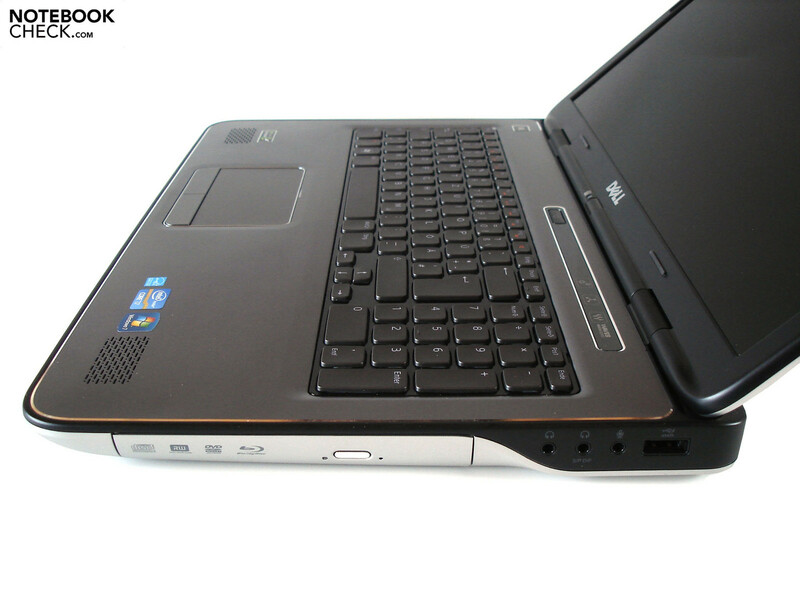 17 inch multimedia laptops with a good graphics card, such as Acer Aspire 7750G, the Packard Bell EasyNote LS11 or the Schenker XMG A701.